On any given day, a Washington DC spring sunrise is absolutely epic. Even in a cloudless sky, you'll see lots of pretty pink and purple hues. With clouds, the sky will often be a stunning bright orange. Add in the phenomenal pinks and whites from the cherry blossoms, and you'll get a pic that will earn allll the Instagram likes. Here's an overview of some of the best locations around Washington DC's Tidal Basin that are the prime shooting grounds for incredible photos. Note that the sun rises behind the Washington Monument, so shooting toward it will get you the most color and light. Arrive at your location a solid 45 minutes before sunrise so you can start shooting as soon as the colors start popping up. Right and Up tip: Wear some comfortable shoes, preferably your favorite running sneaks! If you want to hit several locations during a sunrise, you'll have to hustle to capture them in time. Between the FDR Memorial and the Martin Luther King Jr Memorial. Here you'll be able to shoot across the water and get the Washington Monument. If you're here at sunrise, you'll get lots of bright oranges in your shot. The Japanese Lantern. If you start at the MLK Memorial and walk north on the Tidal Basin trail, you'll see this historic stone statue. It's also a pretty area filled with cherry blossoms with low hanging branches, allowing you to get a shot of the water with a bunch of blossoms in the same image. Any spot looking directly at the Thomas Jefferson Memorial. It could just be me, but I personally love the Thomas Jefferson Memorial. It's especially cool if you get the right angle and you can see ol Tom's statue inside, standing majestically. 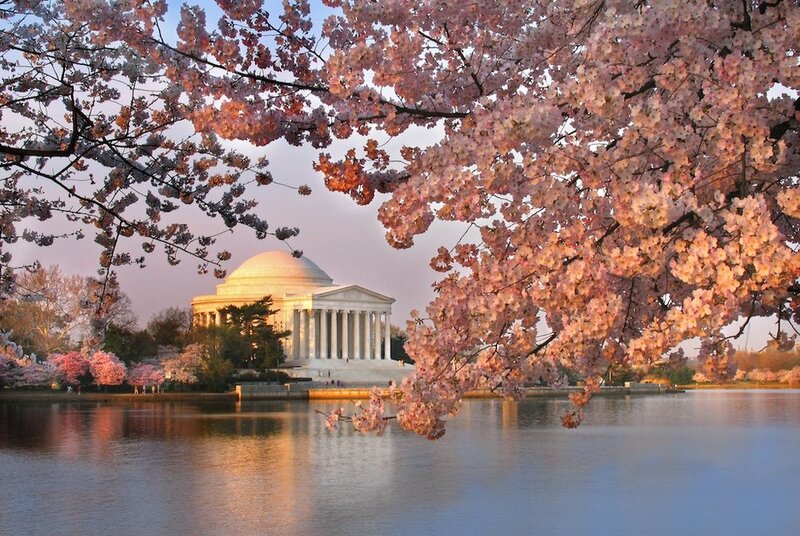 Fun fact: Cherry blossoms aren't just around the Tidal Basin. They're all over the National Mall and beyond. I got a few shots of some across the street from the National Archives and near the Environmental Protections Agency building on 14th Street. I haven't been (yet! ), but I hear the Arboretum is also loaded with them, and it's not nearly as crowded as the Tidal Basin. There are several places to get a great sunrise shot in DC. For Tidal Basin shots, use the same locations I listed for shooting the cherry blossoms. Washington Monument. If you want this famous obelisk, get yourself to the area between the Reflection Pool and the World War II Memorial. You can easily set up your monopod or tripod here and focus on the Washington Monument. If you look closely, you can see the Capitol building just beyond it. The Capitol. Although I haven't been able to shoot it yet, another great place is in front of the Capitol Reflection Pool on the opposite end of the Mall. Here you can get the Capitol building itself as well as the Capitol's reflection and the bright sunrise sky in the water. Lincoln Memorial. As the sun rises, the sky behind the Lincoln Memorial will be a pretty pink, purple and blue. There's a large metal grate on west end of the pool, which is a great place to set up since it's dead center. On a calm day, the Reflection Pool will be like glass, allowing you to get a magnificent shot with the Lincoln Memorial perfectly relfected in the water. As the sun rises higher and higher, the granite Lincoln Memorial will turn a stunning gold. Hence the name "The Golden Hour," I guess! Go inside the memorial to get a few shots of Honest Abe as the sunlight begins to hit his face. Again, on a morning with no wind, the Reflection Pool's calm water will make it look like a massive mirror. From the Lincoln Memorial, you'll get a shot of the Washington Monument and a gorgeous sunrise sky reflection. Not many people know this since it's easy to miss, but there's an engraving in the first platform down from the Lincoln Memorial commemorating the spot where Dr. King read his I Have a Dream speech. I tried to get artsy and focus on the words and capture the sunrise in the background. I'm pretty pleased with the results! I recommend parking just behind the Martin Luther King Jr Memorial, as it's close to everything you'll want to shoot. There is a parking meter here, and payment is required starting at 7am every day of the week. There's a 3-hour limit, and it'll cost you $6. If you're just shooting the sunrise and Golden Hour, this is more than enough time. Bonus: 24-hour bathrooms are here right next to the MLK Memorial bookstore. If you're staying longer, on Sundays you can find free parking on the street. My favorite place is on D Street SW, as it's close to the Tidal Basin and in a safe area. Plus, you can park here as long as you like on Sundays. Any other day of the week, you'll have to pay everywhere you go. Be sure to read signs and be certain that you've paid for the time you're planning on being there. Capitol Police don't play. 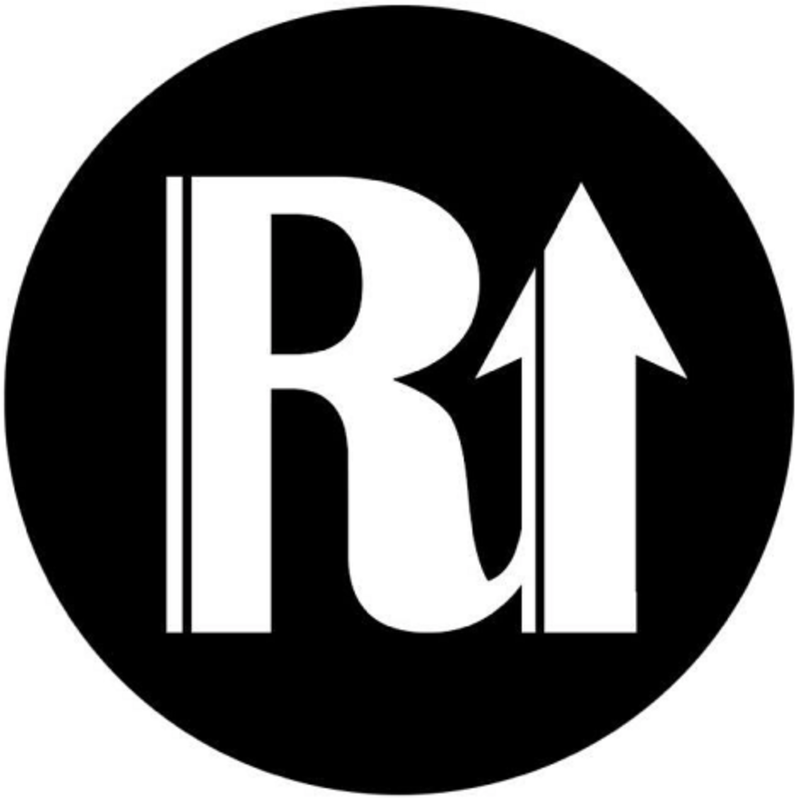 Rachel is the editor of Right and Up. She is an Auburn grad (War Damn Eagle!) and holds a degree in journalism. While working as a sports writer covering the Tigers, she met a cute, tall officer stationed at Fort Benning. A few margaritas, some conversations about why a no-huddle offense is superior and 18 months later, they got married. They have PCS’d to Fort Huachuca, Fort Riley and are now in the National Capital Region. Together they have a son and two dogs.